SNES Maui Mallard in Cold Shadow (USA) in 30:06.12 by funnyhair. 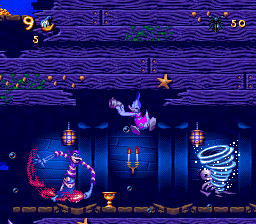 Maui Mallard in Cold Shadow (1996) was among the later games released on SNES, which had its positive impact on production values. As a result, the game sports remarkable design and animation quality. In addition to that, it stars Donald Duck in the role of Maui Mallard, a detective with an alter ego of a blindfolded ninja called Cold Shadow, on the task of retrieving the lost Shabum Shabum idol on a remote tropical island. And no, the plot doesn't get more sensible from that point on. The author, funnyhair, improves on the previous run by nearly two minutes by optimizing movement and boss fights, among other things. For more details, as always, please see the author's notes.